A wall cabinet in its most basic form is little more than a plywood box that is securely mounted on the wall. Wall cabinets typically have one or more shelves (not including the bottom of the cabinet) and may or may not have doors. 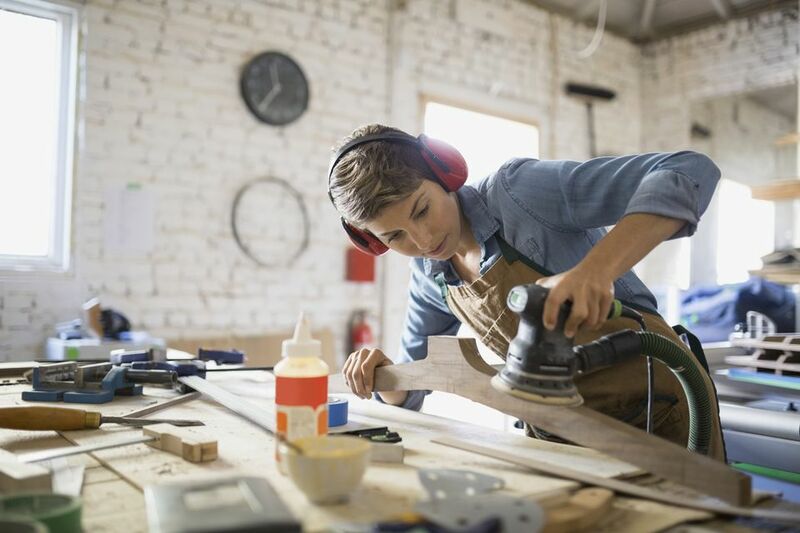 The best material for building cabinets is plywood—3/4-inch plywood for the box sides, top, bottom, and shelves—and 1/4-inch plywood for the back panel. For a 12-by-13-by-24-inch cabinet box with a single center shelf, you need a 2-by-4-foot piece of 3/4-inch birch or other finish-grade plywood and a 12-by-24-inch piece of 1/4-inch plywood. If desired, you can build slab-style or raised-panel cabinet doors separately. It is best to cut all of the cabinet parts with a table saw. Alternatively, you can use a circular saw, but be sure to use a straightedge guide to ensure straight cuts. Set up your table saw with the fence positioned 26 1/2 inches from the blade. Cut a 26 1/2-by-48-inch piece from the 2-by-4-foot sheet of 3/4-inch plywood. Set the remainder of the sheet aside. Adjust the saw fence so that it is 24 inches from the blade. Turn the cut piece of plywood so that the short edge is against the fence, and rip the piece in half. Adjust the saw fence so that it is 13 inches from the blade. Take one of the pieces you just cut, placing a 24-inch side against the fence, and cut it so you have a 24-by-13-inch piece to serve as one of the cabinet sides. Cut the remaining side piece to match. Place a pencil mark along one of the 13-inch edges of each side piece to denote the bottom edge. Cut the back panel to size at 23 1/4 by 11 1/4 inches, using 1/4-inch plywood. The cabinet will hang with a set of French cleats mounted to the back of the cabinet and the wall. Create the two halves of the set with 1x4 lumber. Cut two pieces of 1x4 lumber to length at 11 1/4 inches. Set the fence of your table saw 3 inches from the blade, and adjust the angle of the blade to 45 degrees. Rip a 45-degree bevel along the long edge of each of the two 1x4 boards. Each cabinet side gets a 3/8-by-3/4-inch dado to receive the shelf and 3/8-by-34-inch rabbets to receive the top and bottom pieces. Along the rear edges, the sides get a 3/8-by-1-inch rabbet to receive the 1/4-inch back panel and the 3/4-inch cleat and nailer. Outfit your table saw with a stacked dado blade set to the same thickness as your 3/4-inch plywood. Adjust the height of the stacked dado blade to 3/8 inch. Position the fence so that it is precisely 24 inches from the far side of the dado blade. Place the inside face of one of the cabinet sides facedown onto the table with one of the short edges against the fence, and cut a 3/4-inch-wide rabbet along the end of the plywood side. Rotate the board so the freshly rabbeted end is against the fence, and cut a second rabbet on the opposite end of the board. Repeat the same process to rabbet both ends of the other cabinet side piece. Adjust the saw fence so it is 11 5/8 inches from the near side of the dado blade. Rip a dado groove in the center of each cabinet side panel to accommodate the center shelf. Repeat with the other cabinet side piece. Adjust the saw fence so that it is 12 inches from the near side of the dado blade. Place one of the side panels, with the rabbeted side facedown on the saw table and with a long edge against the fence. Cut a dado groove along one long edge of the face. Repeat with the second side board. Adjust the saw fence to 12 1/2 inches from the near side of the blade and cut each piece again to create a 1-inch-wide rabbet along the back edge of the cabinet sides to accommodate the back panel and the cleat and nailer. Assemble the cabinet with wood glue, finish nails, and screws. It is best to drive the finish nails with a pneumatic nailer, but you can also drive them by hand with a hammer and nail set. Place one of the cabinet sides onto a work table and run a bead of glue along the two rabbets and the dado groove. Smooth out the glue with a small brush so that you have an even, thin layer on all faces of the rabbets and dadoes. Stand this side panel on its side with the front edge of the board against the work table. Insert the shelf securely into the center dado, and drive four finish nails through the face of the cabinet side and into the shelf. Repeat the same process to secure the top and bottom of the cabinet to the side piece. Apply glue into the dado and top and bottom rabbets of the second side piece, then slide the cabinet shelf and top and bottom pieces into position on this cabinet side and secure them with nails. Flip the assembly over so that the long rabbeted sides are facing up. Check for squareness by measuring diagonally in both directions (if the measurements are equal, the cabinet box is square). Adjust if necessary. Place the 1/4-inch plywood back into the deep rabbets. Align the top and bottom edges of the plywood with the top and bottom of the cabinet, double-check diagonally for squareness, and nail the back panel into place. Position the bottom nailer against the bottom edge of the cabinet (flat against the cabinet back), and nail it into place through the cabinet sides. Position one of the French cleat halves along the top edge of the cabinet with the square edge of the cleat against the top of the cabinet and the narrow face against the cabinet back (the beveled edge points down). Attach the cleat to the cabinet sides with finish nails. Additionally, drill countersunk pilot holes and secure the cleat to the cabinet top with four 2-inch screws driven through the cleat and into the cabinet top. Mount the cabinet using the French cleat to carry the weigh of the cabinet, then secure the cabinet in place with screws driven through the bottom nailer. Position the remaining half of the French cleat at the desired height and attach it to the wall studs using 3-inch screws. The short narrow face of the cleat should be flush to the wall, with the beveled edge facing up. Lift the cabinet into place so the halves of the French cleat interlock. Drive a pair of 3-inch screws through the bottom nailer (from the inside of the cabinet) and into the wall studs to secure the bottom of the cabinet.